Warhol’s Dollar Signs are brazen, perhaps even insolent reminders that pictures by brand-name artists are metaphors for money, a situation that never bothered him. The subject of ‘Dollar Bills’ had provided the motif for Warhol’s breakthrough series of 1961, which in turn had prompted his revolutionary exploration of the silkscreen process for creating his paintings. Twenty years on Warhol revisited the subject of money, this time focussing on the elegant curvilinear form of the dollar sign itself. 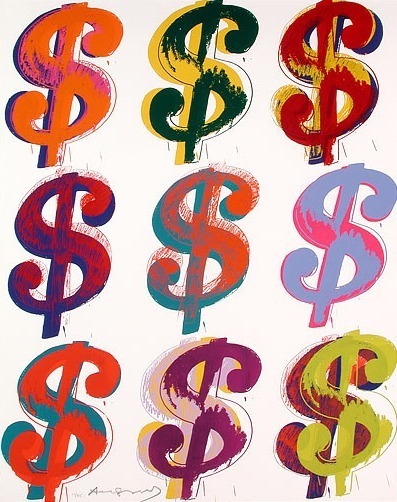 Unlike the monochromatic and static 1961 ‘Dollar Bill’ paintings, Warhol’s 1981 ‘Dollar Signs’ pulsated with vibrant hues, layered energy, as if celebrating the artist’s mastery over his adopted medium. With its striking colors and rhythmic repetition of the single $ motif,White Nine Dollar Signs by Andy Warhol epitomizes Andy Warhol’s singular artistic vision, one that would surprise and captivate in the 1980s and has continued to do so more than three decades later. More than twenty years after his death, Andy Warhol remains one of the most influential figures in contemporary art and culture. Warhol’s life and work inspires creative thinkers worldwide thanks to his enduring imagery, his artfully cultivated celebrity, and the ongoing research of dedicated scholars. His impact as an artist is far deeper and greater than his one prescient observation that “everyone will be world famous for fifteen minutes.” His omnivorous curiosity resulted in an enormous body of work that spanned every available medium and most importantly contributed to the collapse of boundaries between high and low culture.White Nine Dollar Signs by Andy Warhol shows his obsession with consumerism as an artform.